We are happy to announce that we have just launched a new question type that will allow your participants to upload files, which will then be available for you to download in the response. The File Upload question can be customized to only allow certain file types and file sizes (currently up to 25 MB). 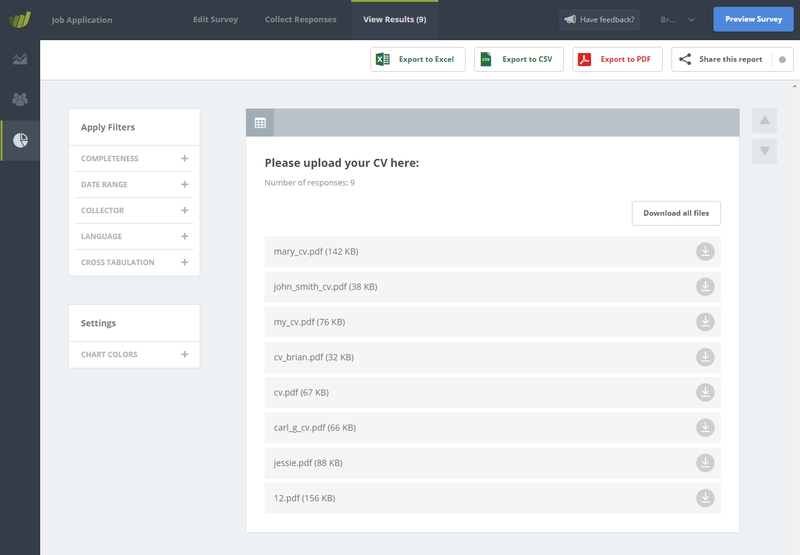 If you require multiple files from the participant, you can simply add multiple File Upload questions to your survey. This is a great way to ask your participants for additional information, such as a Word or PDF document, an image or video, etc. This new question type is also optimized for mobile device, making it easy for your participants to e.g. snap a picture and upload it along with their response. In the survey report, you will be able to download the files one by one or all files bundled together as a .zip file.